To view this edition of the Weekly Notes online, use the following link. [Editors' Note are now below the CONTENTS] REMOVAL INSTRUCTIONS: We do not wish to add clutter to inboxes. To discontinue receiving the WINs, click here. Monday, 3 December 2018, 5:30 - 8 pm - New York, NY - AFIO NY Metro Chapter hosts David Hunt, CIA Operations Officer on "From Russia with Love: Assassinations from the 16th to 21st Century." 7 December 2018 (Friday), 6pm - San Francisco, CA - The AFIO San Francisco Chapter hosts Dr. William H. Overholt on "China's Crisis of Success." Wednesday, 12 December 2018, 6:30 pm - Las Vegas, NV - The Las Vegas Roger McCarthy Chapter Holiday Party. EVENT CANCELLED - Tuesday, 27 November 2018, 5 - 6 pm - Washington, DC - DMGS hears Am�d�e Prouvost on "How The World Bank Manages Risk." Friday, 30 November 2018, 8 am - 5:15 pm - Austin, TX - Texas National Security Forum, "The Return of Great Power Competition." WIN CREDITS FOR THIS ISSUE: The WIN editors thank the following special contributors: ec, po, mh, km, gh, mk, rd, fm, kc, jm, mr, jg, th, ed, and fwr. They have contributed one or more stories used in this issue. The WIN editors attempt to include a wide range of articles and commentary in the Weekly Notes to inform and educate our readers. However, the views expressed in the articles are purely those of the authors, and in no way reflect support or endorsement from the WIN editors or the AFIO officers and staff. We welcome comments from the WIN readers on any and all articles and commentary. If you are having difficulties with the links or viewing this newsletter when it arrives by email, members may view the latest edition each week at this link. You will need your LOGIN NAME and your PASSWORD. We give thanks to all the patriotic, selfless officers and field agents who work in hazardous situations to keep this country safe. We also thank our members, employees, board, officers, volunteers, and other colleagues, for their months of effort guiding the association, and making our events, publications, and educational outreach activities the success they have become. 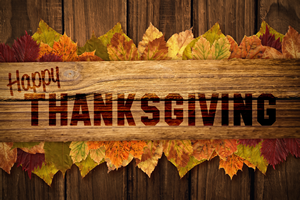 Please join us on this day as we also give thanks with family, friends, and associates. AFIO appreciates your interest and support! 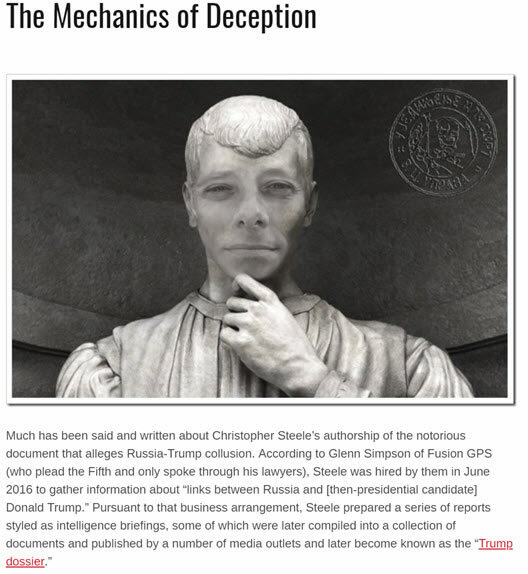 Of interest: "The Mechanics of Deception"
A sweeping analysis — certain to face considerable pushback and counterclaims — using OSINT, face recognition, networking wizardry and other tools of the trade to present a theory about the inspiration and inner-workings of the Steele Dossier. The Mechanics of Deception, was created and uploaded 2018 March 17 by Yaacov Apelbaum who welcomes comments by our members. AFIO National Board Elections have started for terms running 2019 thru 2022. Printed ballots were also sent to all members with the Fall 2018 edition of Intelligencer journal. That issue should reach all members NLT 26 November. No need to wait. The list of candidates and their bios also appears on the online ballot accessed via link below. Current members are asked to cast votes securely online NOW. Shrewd, provocative analysis. Wood looks beyond Putin to explore the profound changes Russia has undergone since 1991. In the process, he challenges many of the common assumptions made about contemporary Russia. Though commonly viewed as an ominous return to Soviet authoritarianism, Putin's rule should instead be seen as a direct continuation of Yeltsin's in the 1990s. And though many of Russia's problems today are blamed on legacies of the Soviet past, Wood argues that the core features of Putinism—a predatory, authoritarian elite presiding over a vastly unequal society—are integral to the system set in place after the fall of Communism. What kind of country has emerged from Russia's post-Soviet transformations, and where might it go in future? 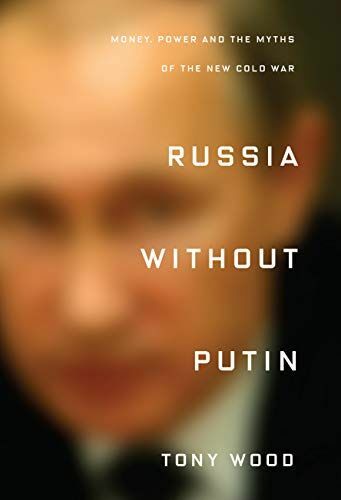 Culminates in an arresting analysis of the country's foreign policy—identifying the real power dynamics behind its escalating clashes with the West—and with reflections on the paths Russia might take in the 21st century. Book may be ordered here. 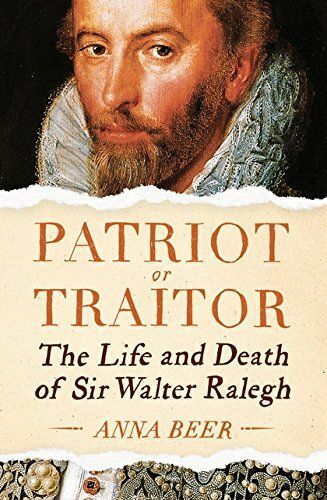 A new biography of Sir Walter Ralegh (c. 1554-1618), a handsome, wily, politically astute, and powerful figure in Elizabethan England. Presents a sharp, sympathetic portrait of a charming man of "dark, Celtic, good looks" who became a favorite of Elizabeth I only to fall precipitously from grace under the queen's successor, James VI of Scotland. He married in secret without the queen's approval, was a "cultural relativist in a century of religious absolutism" and a "poster boy" for "a more decent form of British imperialism, concerned not with "trade and plunder" but with settlement. His plan to found the colony of Virginia was, "only a tiny part of a larger geo-political struggle; Protestant England's war with Catholic Spain"—the adversary nation that Ralegh hated vehemently. "He was the master of persuasion, a man who could make you believe that defeat was victory, that black was white." In 1592, imprisoned by Elizabeth, he bribed his way to freedom; two years later, he was "a freewheeling adventurer" once again, in South America on a quest for gold. After Elizabeth died, he became "a small cog in the very large machine of international power politics," imprisoned, condemned, and beheaded. UT-Austin's Intelligence Studies Project and the Texas National Security Network announce the 2019 Texas Intelligence Academy (TIA), an intensive academic program focused on intelligence and national security from May 20 - 30, 2019 in Washington, D.C. The TIA will offer a competitively-chosen group of UT-System undergraduates the opportunity to learn about US intelligence through lectures by distinguished scholars and practitioners, moderated discussions, simulation exercises, and visits to intelligence-related sites and facilities in the Washington, D.C. area. Students selected for the TIA will be housed in the District of Columbia and study at the UT-System's Archer Center, one block from the White House. All travel, lodging and program expenses for the TIA are provided by the Texas National Security Network. Applicants must be at a sophomore or junior level standing at a UT-System institution, demonstrate a strong academic record and interest in public service, and hold U.S. citizenship. For more information about the TIA and detailed application instructions, please visit here. EU Agrees Plan for Joint Spy School. The European Union has agreed plans for a joint spy training centre, along with 16 other projects, as the bloc makes tentative step towards closer military integration after Brexit. The Joint EU Intelligence School will be led by Greece and based in Cyprus. It will train intelligence agency staff from around the EU in cooperation with national agencies and Nato. Britain, Denmark and Malta are not taking part in the scheme, which is part of the EU's Permanent Structured Cooperation (PESCO) pact to encourage closer defence cooperation. Ethiopia Arrests Former Deputy Spy Chief Yared Zerihun. Ethiopia's former deputy intelligence chief has been arrested amid investigations into corruption and human rights abuses committed by the security forces. Yared Zerihun, the former deputy head of the national security agency, is one of more than 60 intelligence and military figures arrested since Monday. Mr Yared has not yet commented on the allegations. German Prosecutors Charge Chinese-born Engineer in Industrial Espionage Case. German prosecutors are pressing criminal charges against a former employee of chemicals maker Lanxess for allegedly stealing trade secrets to set up a Chinese copycat chemical reactor. The case underscores fears among German officials and executives about industrial espionage in Europe's largest manufacturing nation. State prosecutors in the city of Cologne, where the company is headquartered, told Reuters they had brought criminal charges in June against a Chinese-born German national based on a complaint filed with police by Lanxess about two years ago. CIA Key Official Makes Secret Visit to Seoul. A senior Central Intelligence Agency (CIA) official on Korean affairs secretly visited South Korea and met senior officials of the two Koreas, according to local media reports last week. Andrew Kim, chief of the CIA's Korea Mission Center (KMC), made his visit to Seoul and went to the border village of Panmunjeom on a four-day trip from Wednesday to meet officials of the two Koreas, and returned to the U.S. on Saturday. Intel Agencies Lack 'Adequate Tech' for FOIA Requests. If the intelligence community wants to lessen its information request backlog and avoid lawsuits, the agencies need to make better use of technology and stop applying an "industrial age process ... to a digital age challenge." A Sept. 28 report from the intelligence community inspector general released publicly last week found the agencies' processes for responding to requests under the Freedom of Information Act, or FOIA, is inefficient and will continue to lead to growing backlogs and litigation if not improved. Among the issues is a lack of "adequate technology" to support processing FOIA requests. How An American Spy Predicted the Cold War. On August 23, 1944, a young Eastern European king in his early 20s was arresting the head of his government and switching sides from fighting with the Germans in World War II to joining the Allies. History credits King Michael of Romania with having changed the course of his country's history and shortening the war by months. With the Germans now depleted of oil resources in the Carpathian region, the Soviets were slowly taking over the Eastern European country, changing key people in the government and replacing them with Communist figures. America and the U.K. were far away, and both were keen on keeping their alliance with the Soviet Union, regardless of signs that Moscow was about to take over much of Central and Eastern Europe. It is in this context that Frank Wisner, a lawyer enrolled in the U.S. Navy and stationed in Bucharest, began reporting to Washington about the first signs of what would become the Cold War, reveals a new book by George Cristian Maior, Romania's ambassador to the United States. Throughout his time in Romania, Wisner ran the Office of Strategic Services, an early espionage mission in southeastern Europe that paved the way to what would later become the Central Intelligence Agency, or CIA, in the U.S.
A contract, estimated at $1 billion, to launch 21 Soyuz rockets over the next two years carrying "micro-satellites" - part of a U.S.-based company's plans to offer broadband Internet access over remote territories of the globe, including parts of Siberia. For the company, OneWeb, the effort was seen as a critical step in building out its "constellation of small satellites" and validation for investors who have put up nearly $2 billion. For Russia's space agency, Roskosmos, the contract was both a crucial source of private revenue, and a foothold in the burgeoning global market for small-scale satellite launches. A Life of Spying Puts Iraqi Double Agent in a Canadian Conundrum: His Cloak-and-Dagger Means He Can Neither Stay Nor be Deported. A man who led an eccentric life of spying and espionage, skulking in the shadows as an agent and then a double agent for both Saddam Hussein and Israel's Mossad, has been given a new chance at remaining in Canada, where he is trying to avoid coming face-to-face with those he betrayed. Hussein Ali Sumaida, 53, has won yet another court appeal, one of many legal wins and losses that have so far ended in a stalemate spanning 28 years. Mossad Unveiled: Human Side of the World's Most Mysterious Intelligence Agency. Everybody fantasizes about being invisible, says Israeli filmmaker Duki Dror. "What it would be like to be in a place with a different identity. The subject of covert operations and the people who work undercover is always fascinating," said the 50-something Israeli son of Iraqi political exiles. It was this fascination with how people observe others - especially secret agents and especially the Mossad, about which so little is known - that led Dror to make a film about the experiences of the people working for this almost mythological organization. He was interested, he says, in how actions, "taken by someone unknown, somewhere in the world," could impact history. Intelligence and You: A Guide for Policymakers. It's 9:00 pm somewhere in the trenches of the national security bureaucracy. You are a mid-level policymaker and are scrambling to prepare for the big National Security Council meeting in the morning, when principals will debate and decide the U.S. course of action for the crisis du jour. You need to write a �read-ahead' paper and be able to convincingly brief your principal and maybe even the National Security Council on the state of play in the conflict, policy options based on that analysis, pros and cons of each option, and to ultimately make a recommendation. You, however, have not been reading your intelligence - and you do not even know where to start. Sure, your intentions were good. But the time-sucking reality of recurring crises, endless paper churn, non-stop meetings, and ensuring you are invited to said meetings (with the correct location and a speaking role) overwhelmed you. You have cancelled more morning briefs than you have held. Piles of unopened daily intelligence readbooks spill out of your safe. You can barely remember the names of the analysts supporting you, let alone how to contact them (they went home for the night hours ago, FYSA). You've skated by through weeks of interagency meetings with your three trusty talking points, but now, when the analytic rubber hits the policy road, you realize you do not sufficiently understand the issues at play, nor what options the United States could or should pursue to address them. You, my mid-level policymaking friend, lack intelligence. A Kremlin Spy Mystery in Vienna Shakes the World Capital of Espionage. For a century, Vienna has been the world capital of espionage. It's a city of world-class mystery and intrigue, as depicted in countless spy novels and films. Vienna has it all: lovely vistas, great food and wine, affordable prices, and an extraordinarily permissive environment for espionage. In Austria, you're free to spy on nearly whomever you want, and there are plenty of targets. Everybody has an embassy in Vienna, plus it's the second city of the United Nations. When it comes to espionage, the only way to get in trouble in Vienna is by spying on your hosts - and that's just what the Russians got caught doing. Prosecuting Wikileaks, Protecting Press Freedoms: Drawing the Line at Knowing Collaboration with a Foreign Intelligence Agency. The inadvertent disclosure of the likely existence of a sealed indictment against Julian Assange raises the question of what the constitutional implications of such an indictment might be. Only an indictment narrowly focused on knowing collaboration with a foreign intelligence agency, if in fact the evidence supports such a finding, would avoid the broad threat that such a prosecution would otherwise pose to First Amendment rights and press freedoms. Any prosecution for the publication of the Chelsea Manning disclosures (war logs; embassy cables) or for involvement in the Edward Snowden disclosures would meet the same constitutional difficulties that arose at that time. As I argued in detail in 2011, and then as a witness for the defense in the Manning trial, for purposes of constitutional protection it is impossible to distinguish Wikileaks from more traditional media on stable grounds that cannot be leveraged against all manner of media organizations over time, including both partisan and mainstream media. No distinguishing line can usefully be drawn in organizational terms. Central to this discussion are federal cases concerning journalists' privilege under state law, as well as the Supreme Court's clear statement that "Liberty of the press is the right of the lonely pamphleteer who uses carbon paper or a mimeograph just as much as of the large metropolitan publisher who utilizes the latest photocomposition methods" from Branzburg v Hayes. America's Overt Payback for China's Covert Espionage. While the bombastic U.S.-China "trade war" has been getting the headlines, U.S. intelligence and law enforcement agencies have been waging a quieter battle to combat Chinese theft of trade secrets from American companies - a practice so widespread that even boosters of trade with China regard it as egregious. The Trump administration's much-ballyhooed campaign of tariffs will eventually produce some version of a truce - economists say any other result would amount to a mutual suicide pact. But the battle against Beijing's economic espionage is still accelerating, and it may prove more important over time in leveling the playing field between the two countries. To combat Chinese spying and hacking, U.S. intelligence agencies are increasingly sharing with the Justice Department revelatory information about Chinese operations. That has led to a string of recent indictments and, in one case, the arrest abroad of an alleged Chinese spy and his extradition to the United States to face trial. The Latest Khashoggi Leak Violates Important Norms. The front page of the Washington Post has a revelation: the CIA thinks that Saudi Crown Prince Mohammed bin Salman had a direct role in the killing of Post correspondent Jamal Kashoggi. This is big news and another scoop for the Post's excellent team of reporters. They have done their job well. And it really, really is a problem that they have succeeded. In normal times - by which I mean the entire course of the American Republic, and certainly the time from 1945 until just a couple of years ago - the CIA's conclusions about bin Salman would have been some of the most highly classified secrets within the American government, subject to dissemenation to a small, select group of individuals. The reasons for this secrecy are, classically, two-fold: First, disclosure of what we know deprives the country's leaders of freedom of action, to act with knowledge that U.S. adversaries don't know we have and to select courses of action that maximize America's benefit. Second, disclosure of what the government knows will often "burn" sources and methods so that the inquiry is of the "one and done" variety. When U.S. opponents know what America knows, they often learn how America knows it - and change their behavior accordingly. Jim Gamble, Career CIA Operations Officer. James Wiley Gamble, 81, a career CIA Operations Officer, died 1 March 2018 in Pittsboro, NC. Jim served in the Army from 1954-1957 and had the good fortune to be posted in Braconne, France. There, he began a lifelong appreciation for the French language, gastronomy, and international travel. In 1961 he received a bachelor's degree from The University of North Carolina at Chapel Hill. His professional career was spent with CIA where he spent years working undercover on the front lines of the cold war. This included tours in Africa and Europe, and on the Indian subcontinent. During his long career, he received numerous citations and awards, including the prestigious Career Intelligence Medal. He retired in 1990 but continued on contract training junior officers in the skills required of operations officers. Jim was a voracious reader, student of history, and gifted amateur photographer. Together with his wife Judy, he created beautiful gardens at each of their homes. He is survived by a brother, a twin sister, his two daughters, and other family. The AFIO Florida Satellite chapter presents a double-barreled meeting. Guest Speaker James (JJ) Justice, president of Rolling Thunder Florida Chapter One, will discuss the role of his organization in educating the public about the hidden reality that many American Prisoners of War were left behind after all previous wars, to correct the past, and to protect future Veterans from being left behind should they become POWs or Missing In Action. Rolling Thunder is also committed to helping American Veterans and their families from all wars. A second highlight of this meeting will be the Grand Airline Ticket Raffle of two round trip tickets on American Airlines from Orlando Melbourne International Airport to any domestic destination in the contiguous United States. Raffle tickets will be available only at the 24 November meeting. Sure...like the rest of us, you missed out winning last week's Mega Millions and Powerball lotteries. Well, opportunity is knocking. Here's your chance to win one! Attend this meeting and participate in a raffle with far better odds. Registration: deadline to register is 15 November. Paid, advance registration is required for attendance. For further information, or to register, contact Treasurer Rhonda Rhoads at afiofsc@afio.com or by phone at 321-626-4465. Mail her at Rhonda Rhoads, PO Box 410158, Melbourne, FL 2941. David Hunt, a CIA 32 Years of Distinguished Service with field assignments in Italy, Vietnam, Somalia, Norway, France and New York City, Station Chief in Somalia and New York. Expertise on old Soviet Union. Currently Chairman of Charles Pratt and Company in New York. TOPIC: From Russia with Love. Assassinations are a continuum from the 16th century. David will provide depth and continuity to the 4 March 2018 assassination attempt on Sergei Skripal in England. LOCATION: Society of Illustrators building: 128 East 63rd Street Between Lexington Ave and Park Ave in Manhattan. COST: $50/person. Cash or check payable at the door only. Speaker: Dr. William H. Overholt, President of Fung Global Institute; Senior Research Fellow at John F. Kennedy School of Government at Harvard University and Principal of AsiaStrat, LLC., discusses "China's Crisis of Success." Location: San Francisco War Memorial Building, 405 Van Ness Avenue, Lecture Hall 210, San Francisco, CA. RSVP: Eventbrite Registration is here. Please note: all proceeds from this meeting will be donated to the Veteran's Success Center (VSC), a non-profit dedicated to finding employment for veterans. Contact Mariko Kawaguchi, Board Secretary at afiosf@aol.com with any questions. In a change of pace from our more typical subject matter, we are most fortunate to have as our speaker Mr. Larry Kraus, who is the Director, Intelligence-Led Policing Section of the Pasco County Sheriff's Office. Intelligence-led policing is a new paradigm in law enforcement, sharing a number of traits common to operations in the Intelligence Community. Criminal intelligence flows up to decision-makers at the executive level, who set priorities for enforcement and prevention, and then passes these priorities back down to lower levels of the organization for operational tasking. Fee: luncheon fee is $20 paid by check or cash at the door. Luncheon reservations and arrangements for base access for those without military ID must be made by Tuesday, 4 December by contacting Chapter Secretary at michaels@suncoastafio.org. Event location: MacDill AFB Surf's Edge Club, 7315 Bayshore Boulevard, MacDill AFB, FL 33621. It is that time again and the holidays are upon us. We are pleased to announce this year's holiday party. Please join the chapter for an evening of good food, camaraderie, and a very special guest speaker. Guests are welcome and encouraged. If you have family members or friends who may be interested in learning more about AFIO, invite them to join you for this special evening with the chapter. This is an opportunity to introduce our vibrant chapter to potential new members. Please note that an RSVP is requested by Wednesday, 5 December 2018, to ensure there is plenty of traditional holiday food and fixings on the buffet. Fee: $30 per person. Guests are welcome. Location: Los Prados Country Club, 5150 Los Prados Cir, Las Vegas, NV 89130. RSVP by Wednesday, 5 December 2018 to lasvegasafio@gmail.com or by phone/message at 702-239-1370. Mr. Provoust will discuss how the World Bank manages risk to include non-financial risk. RSVP is required and guests must check in prior to entering the event. DMGS Reserves the Right to Refuse entry and May Ask for Government Issued Identification. RSVP and more information on event is here. Qs? : Direct Qs to Frank Fletcher, Director of Lectures & Seminars, at events@dmgs.org. THIS EVENT HAS BEEN CANCELLED. For your calendar. A special evening to illuminate the critical role of individuals and organizations serving the Intelligence Community, and to raise funds in support of the International Spy Museum. The William H. Webster Distinguished Service Award Dinner will take place at The Ritz Carlton Hotel. More than 600 attendees are anticipated and will recognize the men and women who have served in the field of National Security with integrity and distinction. This annual tribute dinner is given by the International Spy Museum to an individual who has embodied the values of Judge William H. Webster. This year's honoree is a patriot for whom love of country has been his guiding principle: Admiral William H. McRaven, former US Special Operations Commander, former Joint Special Operations Commander, and Chancellor of The University of Texas System. Schedule: 6 pm - VIP Reception; 6:30 pm - Cocktail Reception; 7:30 - 9 pm - Dinner & Awards; 9 - 10:30 pm - Dessert Reception. Tickets Available Now: Prices range from $100,000 to a single seat for $495. Funds raised at this tribute dinner will support artifact preservation, educational programming, research, exhibits, and accessibility programs for underserved communities at the International Spy Museum. To purchase tickets now, do so here. To learn more about this annual dinner, it is available here. Trouble in the Kingdom: An Appraisal of the US-Saudi Relationship with Brian Weidner and Michael Doran. Attend this DMGS discussion of the long and complicated relationship with the Kingdom of Saudi Arabia led by two preeminent national security experts. Recent developments such as the killing of journalist Jamal Khashoggi, which President Trump has called the "worst coverup ever" have brought more attention than ever to the US-Saudi relationship. The relationship has often been characterized as transactional, rather than an alliance of shared values. Are the deliverables of this transaction worth their cost? Sign up for a timely discussion on US-Saudi relations in keeping with Daniel Morgan Graduate School's goal of hosting speakers who can help prepare the next generation of leaders, scholars, and practitioners to develop actionable solutions to global and domestic security challenges. Brian Weidner is an Adjunct Professor of Intelligence at the Daniel Morgan Graduate School of National Security. In his over 30 year career in law enforcement and national security, he has served in the United States Army, the FBI, and the Defense Intelligence Agency. He has taught at the FBI training academy in Quantico, and has appeared as a counterterrorism expert on Fox News. Michael Doran is a Senior Fellow at the Hudson Institute. He specializes in Middle East security issues. In the administration of President George W. Bush, Doran served in the White House as a Senior Director on the National Security Council, where he was responsible for helping to devise and coordinate United States strategies on a variety of Middle East issues, including Arab-Israeli relations and U.S. efforts to contain Iran and Syria.He also served in the Bush administration as a senior advisor in the State Department and a Deputy Assistant Secretary of Defense in the Pentagon. Before coming to Hudson, Mr. Doran was a Senior Fellow at the Brookings Institution. He has also held teaching positions at NYU, Princeton, and the University of Central Florida. His latest book, Ike's Gamble, was published by Free Press in 2016. RSVP Required; Daniel Morgan Graduate reserves the right to refuse entry and may ask for government issued identification. Dress code is business or business casual. The views and opinions expressed in the lecture series do not necessarily reflect the official position of Daniel Morgan Graduate School, its administration, faculty, or students. Where: Daniel Morgan Graduate School, 1620 L St NW, Suite 700, Washington, DC. 20036; Cost: Free. Qs? : Direct Qs to Frank Fletcher, Director of Lectures & Seminars, at events@dmgs.org. This year's forum, "The Rise of Great Power Competition" will feature a keynote panel with Senator Richard Burr, Senator Mark Warner, and Senator John Cornyn of the U.S. Senate Select Committee on Intelligence, as well as a keynote address by Senator Ben Sasse of the Armed Services Committee. Panels will feature experts on global threats, strategies and tactics, Russia, China, and world order. The full agenda can be viewed here. SESSION II. Keynote Conversation on the SSCI Investigation into Russian Active Measures. SESSION III. A Special Conversation on Global Threats...see agenda here. NOTE: Registration is required to attend the Texas National Security Forum. Registration does not ensure admittance. Please arrive early to secure your seat. An overflow room will be available when max capacity is reached. If you register for a UT student ticket, you must bring your UT student ID to be admitted. Registration is now open. The event is free and open to the public, however, advance registration is required to attend each session. All Quiet on the Eastern Front: War in Ukraine from 2015 to 2018 is the presentation at Daniel Morgan GS by Tomasz Grzywaczewski. The conflict which erupted in eastern Ukraine lingers on. Officially it is peace, but when the night falls, gunfire starts again. On and on again. In the pain and suffering of the war, new unrecognized states are born near Donetsk and Lugansk. Since 2015 Tomasz Grzywaczewski, journalist from Poland, has been covering the different stages of the war in Donbas. From the fierce fights in 2015, to the obscure for the modern notion of warfare, trench war in 2018, he has been gathering the testimonies of people entangled in this never-ending conflict, stimulated by the re-emerging Russian empire. This is a story of how, using national feuds and historical resentments, former neighbors, friends and even family members can be drawn into bloody conflict. This is a story about how war becomes part of the human soul and causes it to rot. The PENFED Foundation hosts their annual "Night of Heroes Gala" at the Mandarin Oriental, Washington, DC. Hold the date. Details to follow. 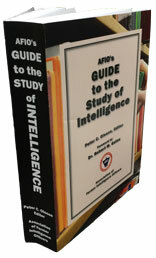 AFIO's 788-page Guide to the Study of Intelligence. Peter C. Oleson, Editor, also makes a good gift. View authors and table of contents here. Perfect for professors, students, those considering careers in intelligence, and current/former officers seeking to see what changes are taking place across a wide spectrum of intelligence disciplines. AFIO's Guide to the Study of Intelligence helps instructors teach about the large variety of subjects that make up the field of intelligence. This includes secondary school teachers of American History, Civics, or current events and undergraduate and graduate professors of History, Political Science, International Relations, Security Studies, and related topics, especially those with no or limited professional experience in the field. Even those who are former practitioners are likely to have only a limited knowledge of the very broad field of intelligence, as most spend their careers in one or two agencies at most and may have focused only on collection or analysis of intelligence or support to those activities. For a printed, bound copy, it is $95 which includes Fedex shipping to a CONUS (US-based) address. To order multiple copies or for purchases going to AK, HI, other US territories, or other countries call our office at 703-790-0320 or send email to afio@afio.com to hear of shipment fees. Order the Guide from the AFIO's store at this link. The Guide is also available directly from Amazon at this link. 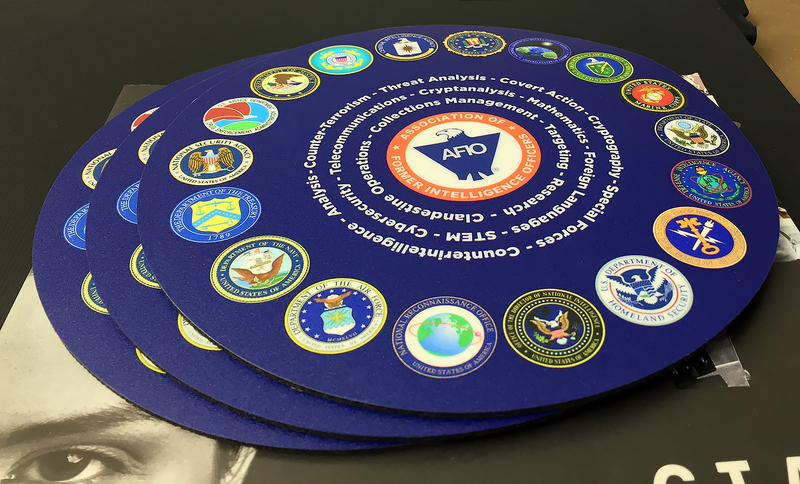 AFIO's Intelligence Community Mousepads are a great looking addition to your desk...or as a gift for others. Made in USA. Click image for larger view. 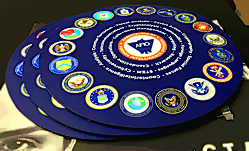 These 2017 mousepads have full color seals of all 18 members of the US Intelligence Community on this 8" round, slick surface, nonskid, rubber-backed mouse pad with a darker navy background, brighter, updated seals. Also used, by some, as swanky coasters. Price still only $20.00 for 2 pads [includes shipping to US address. Foreign shipments - we will contact you with quote.] Order MOUSEPADS here. Weekly Intelligence Notes (WINs) are commentaries on Intelligence and related national security matters, based on open media sources, selected, interpreted, edited and produced for non-profit educational uses by members and WIN subscribers. a) IF YOU ARE A MEMBER - click here: UNSUBSCRIBE and supply your full name and email address where you receive the WINs. Click SEND, you will be removed from list. If this link doesn't open a blank email, create one on your own and send to afio@afio.com with the words: REMOVE FROM WINs as the subject, and provide your full name and email address where you are currently receiving them. b) IF YOU ARE NOT A MEMBER, and you received this message, someone forwarded this newsletter to you [contrary to AFIO policies]. Forward to afio@afio.com the entire WIN or message you received and we will remove the sender from our membership and distribution lists. The problem will be solved for both of us. WINs are protected by copyright laws and intellectual property laws, and may not be reproduced or re-sent without specific permission from the Producer. Opinions expressed in the WINs are solely those of the editor's or author's listed with each article. AFIO Members Support the AFIO Mission - sponsor new members! CHECK THE AFIO WEBSITE at www.afio.com for back issues of the WINs, information about AFIO, conference agenda and registrations materials, and membership applications and much more!